Just because fall is starting to set in doesn’t mean we all need to hunker down indoors. This article excerpt from A World of Health is a great snippet to give you a sense of what the course is like. Enjoy! The future of children in nature has profound implications not only for the conservation of land but also for the direction of the environmental movement. If society embraces something as simple as the health benefits of nature experiences for children, it may begin to re-evaluate the worth of “the environment.” While public-health experts have traditionally associated environmental health with the absence of toxic pollution, the definition fails to account for an equally valid consideration: how the environment can improve human health. Seen through that doorway, nature isn’t a problem, it’s the solution: environmentalism is essential to our own well-being. Has a physician ever prescribed “time in nature” to you? How would you react if she/he did? Given that health care in the U.S. is a profitable business, what will need to happen for doctors to start prescribing “a few days in the country” or in the garden? Do you view spending time in nature as integral to your health and well-being? What are your thoughts? Feel free to post your comments here! *The name of our blog was inspired by the name of our newsletter–which has been in print for seventeen years. The print edition goes out to members of the Northwest Earth Institute–if you are not already a member consider making a donation to become a member today. One of my favorite NWEI course excerpts is found in the first session in Menu for the Future. Organic farmer, Zoe Bradbury, troubled by her inability to make a decision while shopping for eggs, chuckles and wonders if the “quiche sample in the last aisle has been laced with something” causing a sudden onset of indecisiveness. Free range, cage free, local, Omega-3, organic fed, Grade A, AA, natural… the list goes on. No wonder so many people find developing new habits so challenging and give up; all the jargon is just too much to think about. What to do? I weighed, pondered, debated with others, guilt tripped myself, bought the plane tickets and went. My daughter had the trip of the lifetime and we shared a terrific experience. She even said thank you (and anyone with teenage children know that this is monumental). We experienced firsthand what an efficient and convenient rail system looks like. We were shocked by the plastic wrapping on every napkin and disposable chopsticks at every meal. We met some of the most conscientious, honorable people. In Hiroshima, we also saw the horror of what humanity can do to one another and the power of forgiveness. Would I do it again? Under the same conditions – in a heartbeat. Will I venture to another corner of the world in the future? Oregon has so much to offer, but only time and circumstances will tell. As Zoe concluded, conscientious decision making is “simply not so simple”. This may be true, but perhaps the act of wrestling with the complexity of systems, weighing competing values and, in the end, maybe making more positive choices is what being fully alive is all about? Enjoy the wrestling! Here’s a Sample of Our Newest Course! 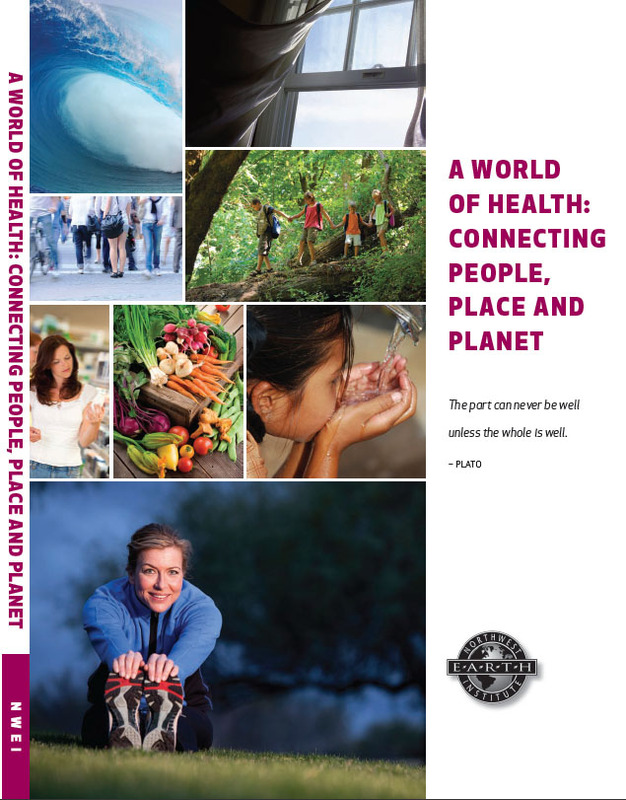 Last week, we officially launched our newest course, A World of Health: Connecting People, Place and Planet. At a launch party last Wednesday night, over 80 people came together and participated in this snippet from World of Health. The feedback we’ve received has been overwhelming. If you’d like to order A World of Health and start your own discussion course, you can order it here! If you’d like to get the flavor of World of Health, here’s a short segment with some discussion questions at the bottom. Enjoy! Though reports of its potential health effects and presence in the linings of containers and cans have long been reported in science journals and the media, an article, “Concern over canned foods,” in the December issue of Consumer Reports has brought concerns over BPA to a broad audience. …. It got me thinking, if I were to try to cut BPA from my diet, how might that affect my life? I’d already replaced my trusty #7 (polycarbonate) plastic water bottle with a stainless steel bottle, amid reports that #7 leached BPA. (Nalgene and other companies have since started making BPA-free versions of these bottles.) I knew not to microwave any sort of plastic, as that’s been shown to leach a range of chemicals present in various plastics, BPA and hormone-disrupting phthalates among them. But if I stopped eating foods packaged in materials known to house BPA, what would my diet look like? I decided to find out by challenging myself to a seven-day, BPA-free diet. The parameters: No canned foods or drinks. No food packaged in anything with a waxy liner. (Not that all waxy lined containers have BPA, but some do, and I wasn’t sure which ones, so I decided to try to stay away from them all.) Nothing with a metal lid since the coating beneath it has been shown to have BPA, which ruled out almost all glass jars. No frozen foods. And my diet had to be nutritionally sound. If all I ate were eggs and fresh foods, unpackaged in the produce section, I could eat a relatively BPA-free diet (discounting the lining on some of the boxes they were shipped in). But I’m six months pregnant, which was another reason BPA-free sounded appealing, since laboratory animals prenatally exposed to it developed various health and developmental problems, and babies take in more of it per body weight than adults. So I was not going to give up any of the major food groups. …I drew up a careful shopping list, focusing on bulk and fresh foods and headed to the store. To what extent are you concerned about the health impacts of BPA in food packaging? What, if any actions have you taken (or are considering taking) to reduce your exposure to BPA or other toxins found in household items? Should keeping BPA out of one’s diet be the consumer’s responsibility? Beyond reducing exposure to BPA, what might be the other benefits of purging it from one’s diet? With great regularity, employee engagement is touted as the key to shifting sustainability from its place in the silo of facilities, “green teams” and the committed few, to fully integrated into day-to-day operations. In response, we educate our employees about sustainability, hold Earth Day events, provide volunteer opportunities to restore wetlands and put up signage to encourage more sustainable behaviors. Toxics here, toxics there, why so many toxics everywhere? Lisa Frack served on NWEI’s curriculum review committee for our new course, “A World of Health: Connecting People, Place & Planet.” Lisa is the Portland-based social media manager for the Environmental Working Group and mother to Coleman (7) and Georgia (4). Following please read an article Lisa wrote for NWEI’s print newsletter this September. If you are interested in finding out more about the topics Lisa discusses, NWEI’s new program is a perfect place to start–call us (503-227-2807) or visit our website for more information on A World of Health. When I was pregnant for the first time, I was all about prenatal yoga, checking my baby’s amazing developing body online, and comparing symptoms with friends. As it should be. What I wasn’t doing was avoiding traffic pollution because I knew it could cause genetic changes that led to asthma, as a recent study shows. And really, how can you? Nor did I weigh the fish I ate to minimize my baby’s mercury exposure. And I happily accepted hand-me-down baby bottles (reuse! save money! ), which I later learned (after years of use) contained BPA. The EcoChallenge is right around the corner. 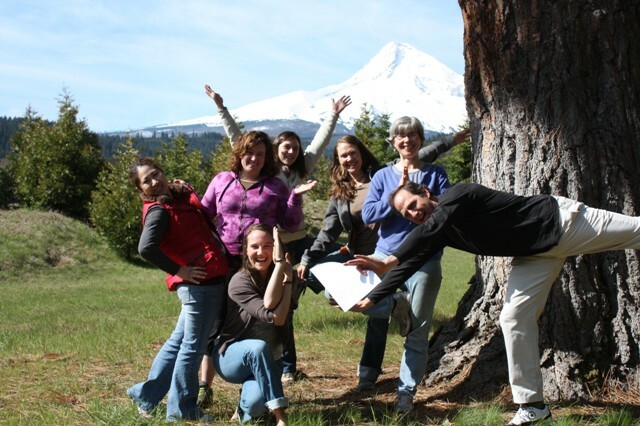 Just three weeks from today the Northwest Earth Institute community will commence fun, inspirational, educational and sometimes humorous sustainability adventures as the participants in the EcoChallenge begin to tackle their personal sustainability challenges. In addition to raising awareness about the importance of taking action on environmental issues, the EcoChallenge is a major fundraiser for the Northwest Earth Institute. The EcoChallenge raises money for NWEI’s sustainability education programs–and this year we hope to raise over $50,000! The entire staff and board of NWEI are participating in the EcoChallenge, and the NWEI staff is upping the ante with a little friendly competition. Here’s where you come in– we’ve all written “Please for Your Pledges” in hopes that we might sway you to support us in the EcoChallenge. The staff member with the most pledges will win an extra vacation day, as well as some serious bragging rights. There’s something for everyone in our “Please for Pledges”— click here to see who is using cute dogs to win you over, who is taking the pity party route, who is planning the most audacious EcoChallenge, and more. And if you are inspired to pledge, you can do so knowing that your tax deductible pledge will go entirely toward funding NWEI’s sustainability programs. A World of Health is here!! The new discussion books are in! And, with some help from our furry friends, we’re getting the books out to you! 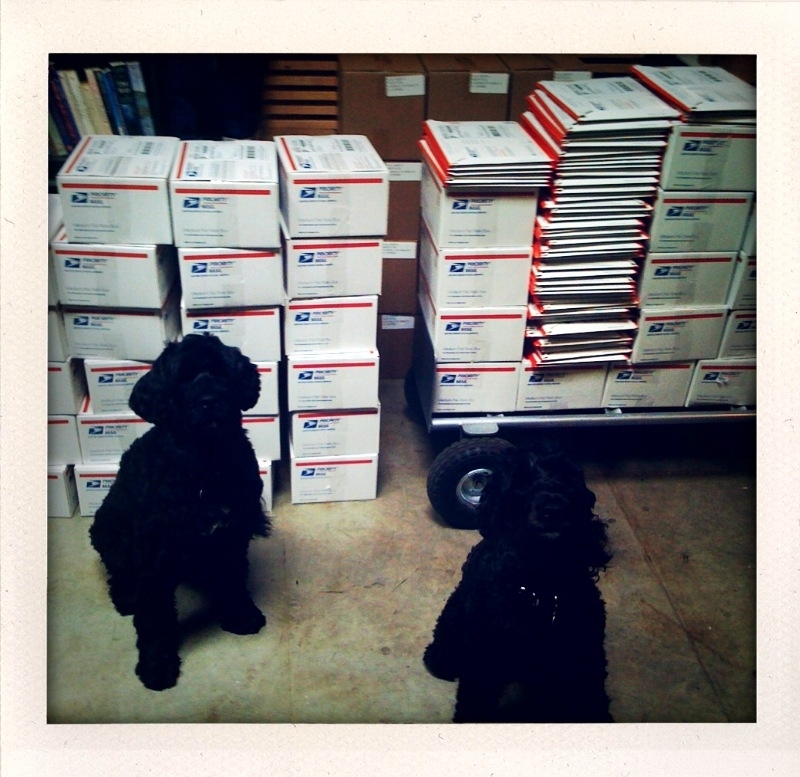 Two of NWEI’s Staff Dogs helped us ship over 500 copies of A World of Health this week! A World of Health is a six session discussion course program that explores “good health,” connecting human health with the environment, and examines how we can sustain both. Learn about the places where our personal health intersects with the environment — our food, our living spaces, our communities and ultimately, our planet. Each session of the book includes readings, video clips, and short assignments with accompanying group discussion questions that aim to inspire sustainable education and lifestyle change to promote a healthier future!